Monday, Apr 1st 2013 – Oman Air Motorbase driver Ahmad Al Harthy delivered two fantastic performances on his race debut in the Avon Tyres British GT Championship at Oulton Park on Monday, 1st April, as he and team-mate Michael Caine finished fourth and ninth in the opening two rounds of 2013. Making a strong impact on the prestigious endurance racing category during qualifying on Saturday, securing an excellent third on the grid for the first of the one-hour encounters, the 31-year-old from Muscat was equally competitive in race conditions and delighted with the whole team effort. Taking the wheel of the Oman Air, Oman Ministry of Sports Affairs, Oman Ministry of Tourism, Nawras, National Bank of Oman and Muscat Eye Laser Centre-liveried Porsche 997 GT3R for the first stint, Ahmad read the rolling start well and maintained his top three placing. Untroubled, the 2012 Porsche Carrera Cup GB Pro-Am 1 Champion pulled out a healthy gap over the chasing pack and held onto the podium placing until making the mandatory driver-change stop at mid-distance. Great work by the pit crew enabled Caine to join the track in 10th place and he fought his way back through into fourth, tantalisingly close to the podium – just 0.8 seconds shy at the finish behind the best-placed Mercedes AMG SLS which held the Briton up during the final 12 laps. Caine took the opening stint for round two which was set to be a major challenge for Oman Air Motorbase starting, as they did, from the ninth row of the grid. Moving into 17th position on lap one, Caine again became stuck behind slower cars – this time a Mercedes and McLaren P4-12C. With that in mind, the team took the wise decision to make the driver-change stop as soon as the pits opened and so Caine peeled off the circuit on lap 17 to hand over the Porsche to Ahmad. Joining the track in 20th place and with plenty of work to do, the Omani made great progress and broke into the points-paying top 10 just prior to the emergence of the Safety Car on lap 28. Racing eventually resumed for a two lap sprint to the finish, Ahmad holding on to the hard-earned 10th place to cap a great drive and a wonderful debut weekend in British GT. Post-race, an amendment to the result was made by officials, elevating the Oman Air Motorbase car to ninth. 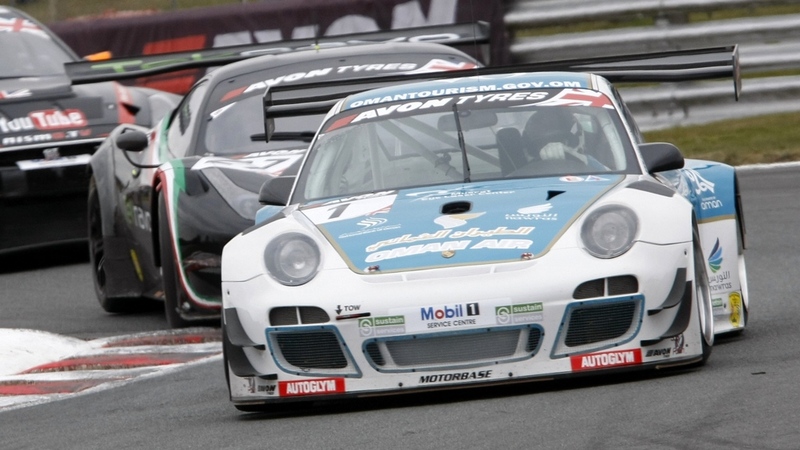 Notably too, the endurance racing rookie adapted very well to the characteristics of the Avon Tyres this weekend having spent his entire career in the UK, in both single-seaters and Porsche Carrera Cup GB, on Michelin rubber. 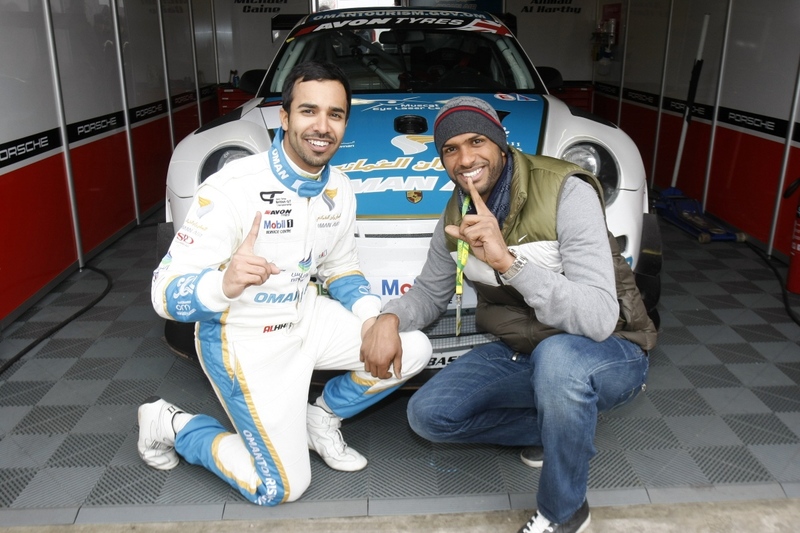 Helping to mark his debut in the Avon Tyres British GT Championship, Ahmad welcomed a whole host of supporters to Oulton Park’s International Circuit for the season-opener, including his famous sporting compatriot Ali Al Habsi – goalkeeper for Premier League football club Wigan Athletic. Ahmad now has a five-week break from action with round three of the 2013 Avon Tyres British GT Championship taking place at Rockingham, in Northamptonshire, on Monday, 6th May.